DuBOIS – Thousands of tiny pieces of tile, in a wide spectrum of colors, shapes, and sizes have been combined in a single piece of art, which now adorns an interior wall in the newly renovated Swift Building at Penn State DuBois. The circular mosaic depicts people of varying ethnic backgrounds and different countries, as well as species of animals found around the world. Fittingly, the piece is meant to symbolize the power of diversity and the commitment the campus community has made to promote and foster diversity. Just like the varied pieces of tile in the work itself, its theme represents the melting pot philosophy of bringing together people from many countries, religions, lifestyles, and backgrounds into one diverse culture. The work is titled, “Let Our Diversity Be a Uniting Force”. 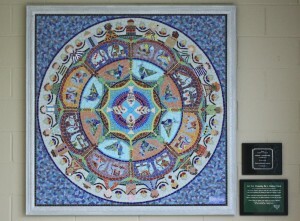 The mosaic was created by artist and assistant professor of education at Penn State Harrisburg, Anju Jolly. It has also been dedicated to the memory of Jordan Andrulonis, a Penn State DuBois student who tragically drowned at Treasure Lake in September of 2009. Andrulonis was a mechanical engineering major and Dean’s List student. He was also a member of the Penn State DuBois wrestling team and active in intramural athletics. Efforts to get the mosaic in place started when Chancellor Anita McDonald and Co-director of Academic Affairs Maureen Horan decided the wall in the freshly made-over building would be a great place to showcase artwork. However, the pair believed the artwork should be meaningful, representing something dear to the campus community. Horan contacted Jolly, who was an old friend, and the group brainstormed ideas for a theme. Jolly’s imagination and talent did the rest. “Each piece represents you, the people that make up the diversity of this campus,” Jolly said at the ceremony held recently to dedicate the mosaic. The dedication in honor of Andrulonis came together when Jolly first remarked that she did not wish to receive payment for her work, but would instead like to donate the art and see a dollar amount equal to its value donated to campus scholarship funds. Mark Freemer, of DuBois, who is also the chair of For the Future: The Campaign for Penn State Students at DuBois decided to make that donation on behalf of his wife, Betty McFadden Freemer, in honor of her son, Andrulonis. The reflection of the campus population that the Freemers see is exactly what the artist had in mind. Jolly worked at Penn State DuBois in the 1980’s and 90’s before moving on to teach at Harrisburg, so she knows the campus well. “This mosaic depicts a sphere in which all of life is connected. The outer circle represents the diversity of people and cultures on earth.